I got this from another Nancy, a new blogger I’m going to read regularly. 1. What’s the scariest movie you’ve ever seen? Jaws. Honestly, I had nightmares about that opening scene and still can’t watch it. 2. What was your favorite Halloween costume from childhood? I don’t remember many of my costumes. I did a digital layout of one when I was about three or four years old. 3. If you had an unlimited budget, what would your fantasy costume be for this Halloween? 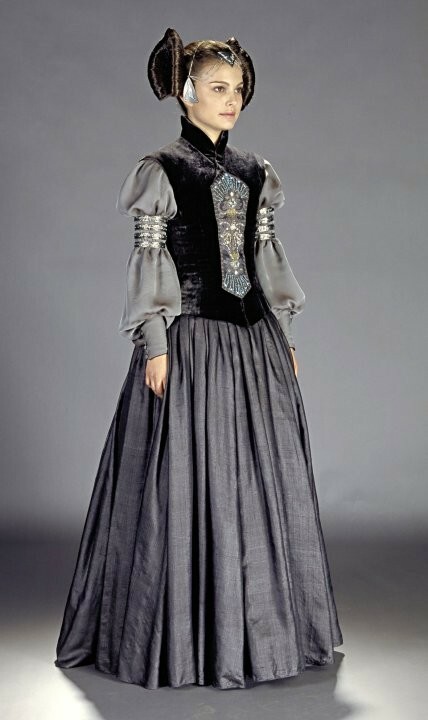 Oh, I’d love to dress in one of Padme Amadala’s dresses from Episode II – the one she’s wearing when she’s packing to leave. I WANT that dress!!! 4. When was the last time you went trick or treating? I was probably about 10 or so. 5. What’s your favorite Halloween candy? Anything peanut and chocolate – Reese cups, etc. 6. Tell us about a scary nightmare you had. I remember dreaming when I was a kid that my mother wasn’t really my mother and she left me with a woman I didn’t know. As an adult, I have dreams about going into an elevator and having the exit disappear, leaving me trapped in a box with no way out. 7. What is your supernatural fear? Supernatural? I don’t really have a fear of those typical supernatural creatures – vampires, ghosts, etc. As a devout Catholic, I fear dying in a state of mortal sin more than anything. 8. What is your Creepie-Crawlie fear? Spiders and now, since moving to Louisiana, roaches. 9. Tell us about a time when you saw a ghost, or heard something go bump in the night. A couple of weekends ago, everyone in the family was gone overnight and the house was WAY empty. Every sound made my skin crawl. I hated that. 10. Would you ever stay in a real Haunted House overnight? I don’t believe in ghosts or spooks or whatever, but I hate bugs and mice and rats. Those things would frighten me the most. If I “had” to stay in an old abandoned house, I’d just keep the lights on all night and read. 11. Are you a traditionalist (just a face) Jack O’ Lantern carver or do you get creative with your pumpkin? My husband does the carving with the kids and he can get creative. He did a spider once. 12. How much do you decorate your home for Halloween? I put a Halloween table cloth on the dining room table and I made a couple of Halloween fabric bowls. We put our Jack O’Lantern in the window. I’m not into the witch or spooky stuff, but I like the bright lime green and purple colors, and would like to do more in that way. 13. What do you want on your Tombstone? She followed God and loved her family. Thanks for visiting and playing! I’ll be back. Friday Feast – third one here.